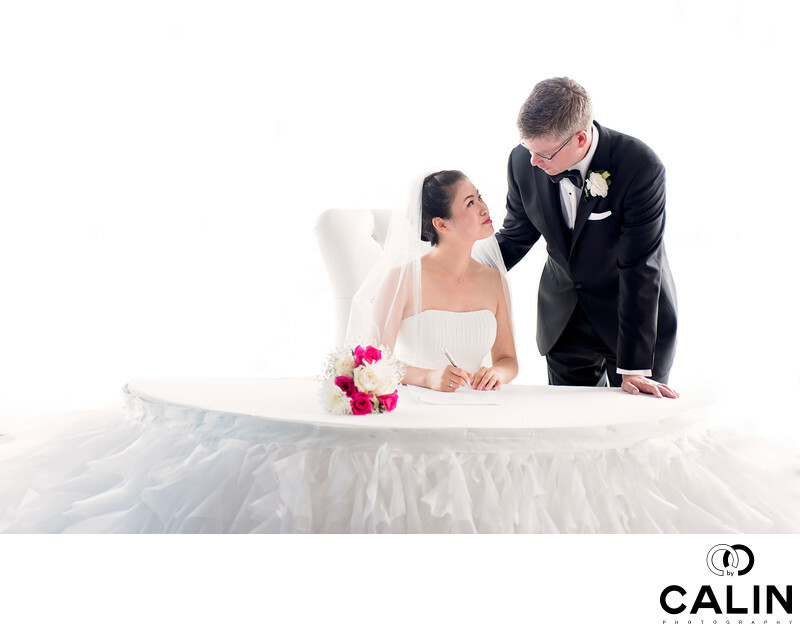 This is a candid image of the bride and groom captured during the signing of the marriage certificates at an Atlantis wedding in Toronto. Without false modesty, I can say that I created a few iconic images as a Toronto wedding photographer specialized in Atlantis weddings. This is just one example. In this wedding picture, the bride is about to sign the marriage certificate when she looked lovingly towards the groom. He reciprocated with a long gaze and touched her shoulder. It was at that split second when I captured the moment for the posterity. The background is completely white as if the image was captured in a fancy studio with perfect lighting. In fact, the reality was quite the opposite. As the newlyweds had their back towards I encountered strong back light on this sunny summer day. As such, I had to compensate by overexposing the image by 2 to 3 stops. That, in affect, made the background disappear. Of course, in post-production, I removed some window frames and other distracting details that were stealing the show in this photograph. In addition, I softened the brides skin and adjusted the exposure and the white balance. The main ingredient of any good photograph is the light. In fact even the word photography means writing with light. Light is so important for a good photo that the absence of light means the absence of the photograph. In this wedding photo captured in the Lakeview Ballroom around noon on a sunny day in July, the right light was coming from behind the couple. Most Toronto wedding photographers I know shoot in a semi-automatic mode such as Aperture value. That the renders this type of image dark. Because the camera meter sentences a lot of life coming on the sensor, the camera computer automatically adjusts the exposure by darkening the photo to compensate for the bright light. In effect, the camera exposes for the background leading the subjects in the dark (the pun is not intended). In this tricky situation the wedding photographer should compensate by overexposing by 2 to 3 stops to obtain the proper exposure of the bride and groom. That is exactly what I did in this image. In order to capture this gorgeous wedding photo, I used a Canon 85 mm lens shot at F2.5. I only used ambient light and by shooting at this aperture, combined with a high ISO, it gave the light a wrap-around effect. This ethereal or dreamlike look is something that every bride wants in her wedding pictures. This photo was taken at Atlantis Toronto. However, the principles of light and composition apply to any wedding venue in the GTA. This image could have been as well taken at any other venue in the area. The focus is on the bride and groom and there is no element that helps the viewer identify a particular location in this photograph. When we talk about emotion we need to analyse the emotion exhibited by the subjects in this photograph but also the emotion the picture evokes. Let's talk about the first. In this image, the bride and groom are expressing their love for each other more than words can describe. Often, I see the couples totally disconnected during this phase of the wedding ceremony. Usually, the bride signs the marriage certificate while the groom is waiving to his groomsmen, anticipating the wild wedding reception. However, in this image the groom is gently touching the brides shoulder in a loving and protecting gesture. As a Toronto wedding photographer, I learned to be exigent when when it comes to my work. However, in this case I can openly admit I have yet to see such a beautiful wedding picture taken at Atlantis Toronto.